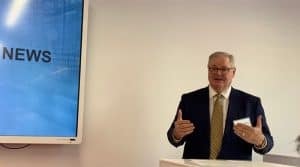 Recently, Ricoh invited industry analysts to a special briefing at their customer experience center in New York City. At the event, CEO Joji Tokunaga introduced Senior VP of Marketing, Glenn Laverty and VP/GM of Ricoh’s Imaging Systems Steve Burger to discuss the finer points of their “Dynamic Workplace Intelligence” approach to the business and their new, flexible IM C Series of MFPs with Always Current Technology. 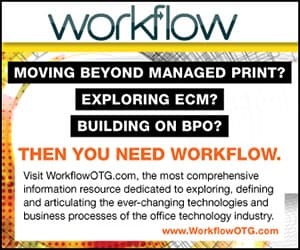 This isn’t your grandfather’s — or even your father’s — document imaging industry. The big players have long realized that they aren’t always going to be able to use things like speeds and feeds, finishing options and other hardware-based features to differentiate themselves from the competition. A few extra PPMs, a slightly larger document feeder or a marginally lower operation cost might have been enough to convince customers to go with their devices in the past, but not so much now. After all, back then most business processes were being carried out in paper form, so the faster you could get information on paper, the faster your processes could move. But constant and rapid evolution in the technosphere is changing the way customers get the job done, and thus, what they require from your copiers and MFPs. Now, customers demand MFPs that are information hubs where workers, information, and core business systems come together and grow with their constantly changing needs. 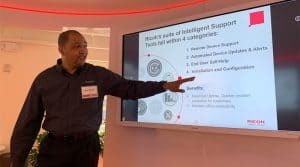 The Dynamic Workplace Intelligence approach is meant to bridge the divide between Ricoh’s technology and the way their customers get work done, especially as those needs change over time. 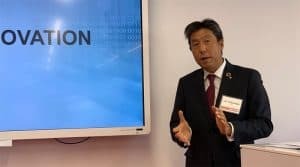 It leverages the company’s hardware and software, Ricoh Cloud Workflow Solutions, Smart Integration platform and Always Current Technology, and Intelligent Product Support to reduce costs, boost productivity, and lock down sensitive information. The Ricoh IM C Series consists of six intelligent MFPs, including the IM C2000, IM C2500, IM C3000, IM C3500, IM C4500 and IM C6000. Each device leverages Ricoh’s Always Current Technology, Cloud Workflow Services, and Smart Integration Panel to deliver a scalable MFP that easily integrates with your customer’s IT environment and can support its own cost-saving, productivity-enhancing and security-boosting applications. The entire series also features Android-based, full-color touchscreen tablet displays that leverage Ricoh’s Smart Operation Panel. Ricoh recently updated their Smart Operator Panel and beefed up the IM C Series’ processing power, swapping single-core processors for quad-core alternatives, to support the complex operations that customers require from their MFPs. While not brand new, Ricoh Cloud Workflow Services was part of the discussion. The 10,000-foot view is this: Ricoh Cloud Workflow Services are a collection of applications that are built to improve productivity, lower costs, and boost security. Currently, the portfolio of applications is filled out with a variety of connectors and workflow apps. Traditionally, customers would have to purchase a new MFP if they wanted to take advantage of the latest and greatest features and functionalities. However, the average lease takes about three to five years to mature. And over the lifespan of any given lease, you can expect both the business processes and the technology driving them to be different on the 1,095th day than they were on the first day. The folks at Ricoh see this as a problem because the rapidly changing conditions make it difficult for the company to ensure that their technology is always able to meet customer requirements throughout the entire lifecycle. Enter the Always Current Technology Platform. This platform will enable customers to scale their MFP investment over time. “When you buy a smartphone, you upgrade the operating system, you add apps, and so on,” said Steve Burger. The folks at Ricoh believe that things shouldn’t be much different with their MFPs. The Always Current Technology Platform enables customers to purchase services, activate features or install and regularly update applications to accommodate their changing workflow requirements. Firmware updates can also be applied automatically to keep the environment secure and ensure optimized performance. People said that digital transformation would be the death of the copier industry. But in reality, it’s just a catalyst for change. It’s pushing OEMs like Ricoh to re-think their approach and develop new technology that can accommodate their customers’ changing needs. They can no longer look at their products in terms of hardware or software or services or support — they have to think of their entire portfolio of products as a holistic solution for bringing humans, information, and critical business systems together.